Several centuries ago the art of cartography included a parade of creatures that beautifully reflected the fears and beliefs of the time. Of the vast spaces on the earth’s surface, the sky and the sea have been the chosen depths for explorers. The sky, crossed only by clouds during the day, has been and continues to be the most effective compass during the night when it is filled with constellations. For mariners, the sky ensured a route; for the first philosophers, it provided proofs and hypotheses on the astronomical dimensions of the universe; for mystics and the religious, it was an expression of divine will and a macrocosm, a guide to predict individual destines and even to diagnose illnesses. The ocean, its counterpart and mirror, has always been more threatening, perhaps because it has been more transited: the sea was for centuries a place of adventure and journeys; conquest, war and trade. Despite the familiarity with which mariners sailed the seas, their depths remained a mystery for centuries and, let’s face it, they remain so to this day. 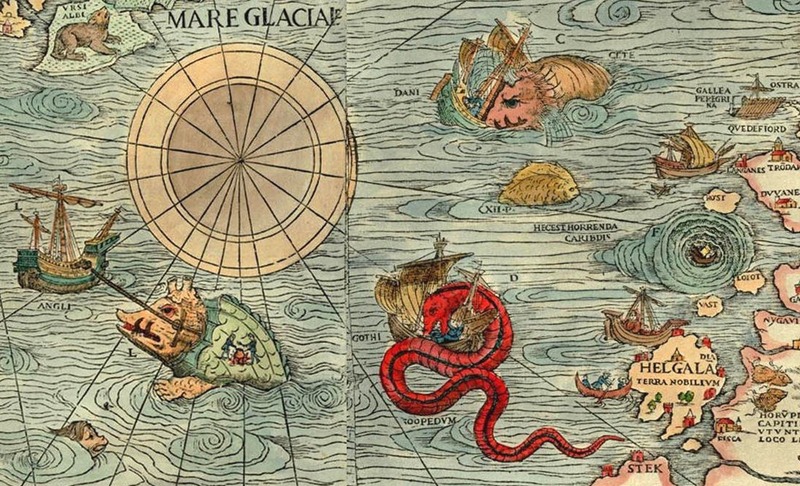 Medieval and Renaissance cartography is a very interesting example of how fear of the unknown and that real danger that is the power of the natural elements were graphically projected in fantasy figures such as sea monsters. Placed on coasts or straits where the danger of shipwreck was very high (think of Scylla and Charybdis) or in unknown territories (terra incognita) or little-explored areas, sea monsters are at the same time exquisite decorative elements, imprecise zoological documents and indispensable elements to decipher a world view. 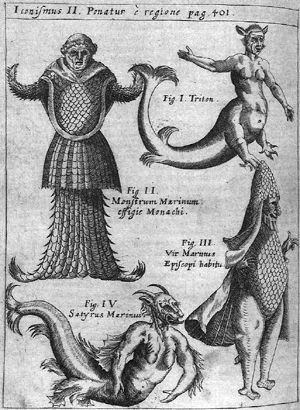 In some cases there was no pictorial representation of the monster, but there was a warning: hic sunt dracones (“here are dragons,”) an indication that can be read on some mapa mundi and that pointed out unknown seas. 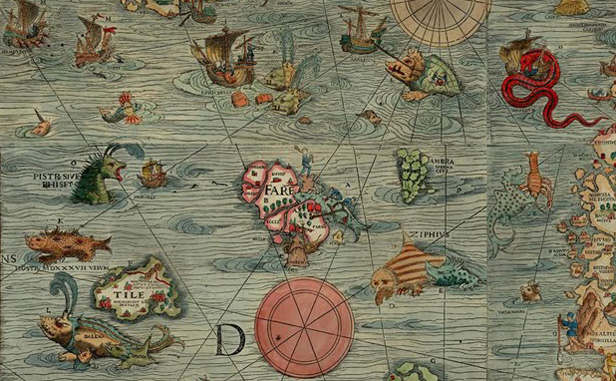 Cartography with fantastical beings even became a political-commercial strategy: on a map of the Norwegian Sea by Olaus Magnus from 1539, the Scandinavian peninsula appears surrounded by fearful creatures, a strategy to dissuade foreign fishermen from venturing into those lands and plundering the local fish. Which monsters terrorized ancient shipping? Often they were creatures that today we would not classify as part of a bestiary, such as whales, dolphins and walruses, but as they were a rare sight in those days they were considered monstrous. Chet van Duzer highlights this fact: while monsters in cartography swim on the surface, and therefore reveal their full bodies, or at least show it to the extent that the rest can be easily imagined, the experience of navigators was much more diffuse and ephemeral, and as a result, terrifying; sea monsters on maps, were perfectly outlined, and are, strangely, a way of making the unknown familiar, apprehending the incomprehensible. On other occasions, the creation of monsters by cartographers (it must be remembered that medieval maps were drawn by hand, to order, and the most outstanding were often exhibited as a sign of social status, more than used for navigation) and were based on theological precepts concerning the physiognomy of the animal kingdom. The idea that to each terrestrial being there corresponds a marine equivalent, expressed, for example, by the Roman naturalist Plinio, resulted in the abundance of hybrid beings (dog-fish, fish-hen, fish-lion and even fish-goat). 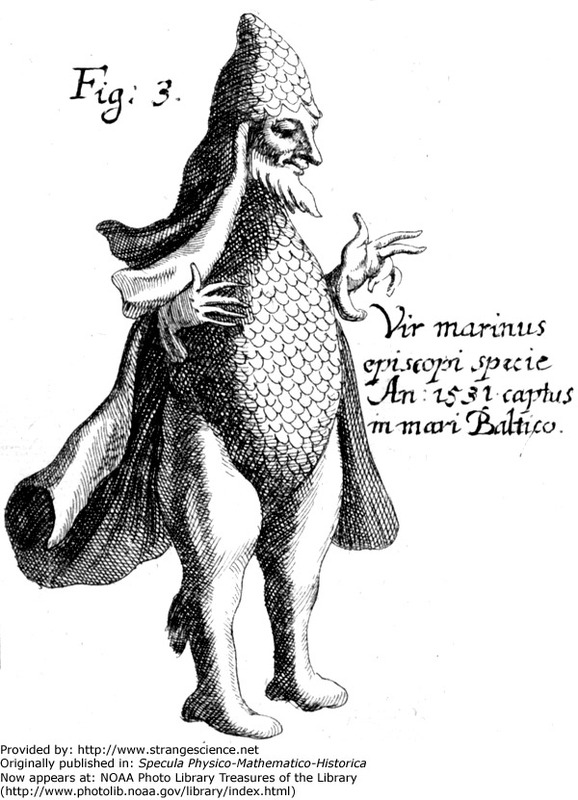 This notion is perhaps also rooted in the creation of mythological beings, half human, half fish, such as mermaids and Triton; in the mid-16th century, the acute imagination of Giacomo Gastaldi pushes that hybridization to murkier territory, that of social stratification, with the insertion of aquatic monks and bishops in one corner of his Cosmographia Universalis et Exactissima iuxta postremam neotericorum traditionem, figures that would be reiterated by other contemporary artists and reproduced centuries later by scientists such as Gaspar Schott and Johann Zahn. This brief journey through the diversity of creatures that populated ancient maps is clear evidence that curiosity surrounding the ocean depths was a constant in the history of humanity and has been broached from diverse angles; the unnerving and, at the same time, desired presence of sea monsters on medieval maps does not respond to a need to chart a physical territory but rather an intention to populate and elucidate the map of other landscapes impossible to locate geographically, those of our own psyche.